Camping & Bungalows Roche är en camping i Conil de la Frontera, Cádiz, belägen i skogen. Campingen har platser med stängsel, utan skugga och platser med lite skugga. Camping & Bungalows Roche ligger i närheten av en sandstrand. Det finns möjlighet att hyra bungalows. För den sportige semestervandraren har campingen utflyktsprogram och olika cykelleder. Det finns ett ett fitnessrum. Campingen förfogar över en utomhusbassäng och ett knattebad. I Camping & Bungalows Roche är det tillåtet att snorkla och vindsurfa. Denna inspektör gör varje år ett besök på Camping & Bungalows Roche och inspekterar campingen för ca 200 faciliteter och för andra förekommande punkter. Inspektören är en medarbetare från ACSI och arbetar inte för campingen. The approach roads to the campsite are narrow so be cautious when pass another large vehicle. The campsite is large and has bungalows as well as. The pitch sizes vary but we got to choose which one wanted. Decent size swimming pool and there are also tennis courts. The area where you can dump your waste, you can also wash your motorhome. The main ablution blocks were not great but found the newer block in the far part of the site was better. The toilet doors there had locks and the showers were in the same block unlike the other blocks. No soap in toilet blocks or hand dryers. We were kept awake at night by loud cockerels, dogs barking and a donkey. There is nothing to see around the campsite and no nearby public transport to get you into Cadiz. We did use our bikes to cycle to Conil itself which has an interesting museum. The site seems very pleasant until the smell of the grey sewage water hits you. We were surrounded by sprinklers for much of our stay and even had to surrender half our paid-for double pitch, moving our equipment, at the end of our stay so it could be watered. We stayed in a foul smelling stench for much of the end of our stay. The site would have been really good but was completely spoiled by the vile smell all the time. We shall not come back. The actual camp site is certainly one of the best we have stayed at in Spain. The pitches are all lush grass and neatly kept. The showers, toilets wash areas are excellent. The difficulty we encountered was isolation. Contrary to the listed info. The bus only runs for two months during high season and then it's only twice in the morning and once at 7.30 pm back to near the park. We had bikes , but it is not an easy or for that matter a very safe ride into Conil. The bike lane is narrow on on the main busy road. As for the beach, well it's a good two plus km. Conil is a lovely village , again it's a measured 4.5 km. We would not return due to its isolation, but a lovely park. The bar area had no internet,in fact the whole camp had little or no internet. The bar was not co operative at all during our stay with the euro2016 football...refused to put the TV on !! Lovely campsite in the countryside near Concil. Facilities all very clean, with plenty of hot water. Bit of a trek to the coast walking, but absolutely beautiful sandy beaches once you got there. Good cycling. We didn't see 19 km marker, but found site a different way eventually! Easy when you know where! Bar and restaurant on site, plus small supermarket with basics. Would return to further explore area. This is undoubtedly the best campsite we have stayed on in Spain. The toilet facilities were very modern and extremely clean with plenty of instant hot water. The pitches were covered in thick green grass with water taps and electric points very handy. We would certainly visit again. A very pleasant site about 2 - 3 km from Conil de la Frontera . The pitch we had was more than adequate for our 7.4 m caravan , awning & car with plenty of room for stretching out on sun loungers. The showers & toilets nearer the pool were quite old with no locks on the doors , the ones in the far corner were excellent & included door locks ! . The food in the restaurant was excellent , we loved the prawns pil pil & on our last evening after taking down the awning & preparing the van for an early getaway we had a wonderful steak each .Our only complaint generally was the barking dogs surrounding the site but this is endemic in Spain & no fault of the site owners. Our second year at this site - loved it last year so decided on a revisit. It's a very well maintained site with beautiful grassy, spacious pitches, and plenty of choice at the end of May as not very busy. There is electricity and plumbed in water and waste convenient to every pitch. The wash block at the far end of the site where we pitch up are immaculate and quite new with good washing machines (€4 token from reception). The staff are very helpful and take good care of the facilities and there is a nice bar and restaurant. The pool is a good size with plenty of loungers provided, just busier at weekend when Spanish families come and stay making the place that bit busier but not too bad in May and June. The surrounding area is lovely and flat with quiet roads for cycling. There are a couple of lovely coves a few km away heading towards Roche, just beyond the Lighthouse. Conil is a beautiful town with the old part being very charming with plenty of small bars and restaurants to choose from and the beach is very long and clean and again popular with Spanish families on a weekend (dogs allowed). My only niggle is being situated in the countryside there are the noises in the night of the local residents - donkey, cockerels and dogs barking, and the lovely odour of the nearby cow herd, but the delights of this site far outweigh this - just take earplugs! Fully recommended. A very clean and pleasant camping site, Pitches on flat grass area with unshaded area good in winter Free wifi but not good signal. Main town of Conil half hour away with supermarket. Ideal site for cycling to visit Cape Trafalgar, other cycling routes. Very enjoyable stay. Vill du boka campingen Camping & Bungalows Roche eller få mera information? Det går bra med nedanstående uppgifter eller via campingens webbsida. 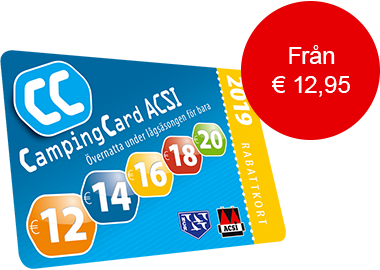 ACSI Eurocampings skickar din informationsförfrågan till "Camping & Bungalows Roche".